The Grateful Dead has played more than 2,500 live shows and are followed by a subsequent subculture that, to this day, come out in droves to listen to the live craftsmanship of any act associated with the band. Perhaps this is why you are here? Robert Nelson collaborated with The Dead; this is why he is here. Robert Nelson is an accomplished Bay Area creative. Born in San Francisco in 1930, Nelson attended and graduated from San Francisco State College in 1957 and continued his education at the California School of Fine Art up until his marriage in 1958. After a brief stint selling encyclopaedias, he moved to Spain with wife Gunvor where he continued to paint. After a short hiatus from the Bay Area, Nelson returned to pursue a career in experimental filmmaking, during which he taught art at both the San Francisco Art Institute and San Quentin State Penitentiary. He contributed to 19 short films before shooting The Grateful Dead in 1967. During their early years, 1962-1965, The Grateful Dead were known as The Wildwood Boys and Mother McCree’s Uptown Jug Champions. They played many San Francisco coffee houses and bars rehashing old Leadbelly and Jimmie Rodgers favourites. They cut their first album in 1965 as The Warlocks, putting aside banjos and pedal steel guitars for pianos and the electric bass. 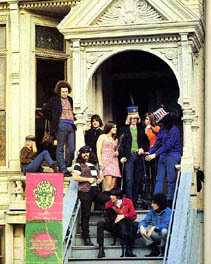 However, it was outside the studio, playing numerous live performances – the ambient backdrop to the San Francisco Acid Wave of 1965-66 – where the band began to gain prominence as a cultural icon. Nelson met The Grateful Dead through their manager, Bill Graham. Graham had moved to San Francisco from New York to manage The San Francisco Mime Troop, a local improvisation group that encouraged Nelson to screen his experimental short films during intermission. Soon thereafter, Graham bought the Fillmore Auditorium in the infamous Fillmore district of San Francisco. Graham staged a local, up-and-coming guitar band named The Grateful Dead as the house band. The Fillmore was to play host to numerous concerts and Acid Tests as part of its inauguration. Nelson was given the opportunity to film one of these early performances. Incidentally, Nelson had shot Building Muir Beach House in 1961 at the locale for what would later become one of the legendary Acid Tests, held in December 1965. The Grateful Dead was shot with 262 feet (79m) of available film and was transferred on a homemade optical printer, fashioned by Nelson’s colleague Lauren Sears. The band was interested in having a montage projected onto the wall of the Fillmore Auditorium as a precursor to their shows. It was hoped to have the audio-track represent what was being captured in the studio while the visuals were intended to embody, and subsequently document, the ambiance associated with the scene. This “scene” has grown into a fraternity of live show collectors and historians eager to attain and document rare performances. The authenticity of many show dates, venues and set lists are under constant scrutiny amongst the Deadhead in-group. Nelson’s The Grateful Dead is no exception due to its lack of availability in North America. There appears to be a rift in consensus, a “grate” debate as to whether the totality of this film is actually authentic concert footage or an inauthentic pastiche of numerous performances. For instance, the Kramer Family Library at the University of Colorado at Colorado Springs suggests that there was a definite set list captured by Nelson. They list his audio-track as containing the songs “Sitting on Top of the World” (Jacobs/Carter), “Cold Rain and Snow” and “Golden Road to Unlimited Devotion”(both written by McGannahan and Skjellyfetti) (1). This would mean, however, that the audio-track is inauthentic as The Grateful Dead only performed “Golden Road” live five times, despite its release on the band’s greatest hits album Skeletons from the Closet, 1974. In fact, “Golden Road” was never played in concert with either of these other songs. Claims about the “inauthenticity” of the audio-track might not be that off-base however due to the fact that Nelson had a propensity for splicing and augmenting his reels. He is known to have six different versions of his 1965 short film Oh Dem Watermelons. As you will see, however, Nelson filmed an authentic “jam” (and subsequent frenzied response from the crowd) at one of the numerous Acid Tests The Dead played at during the period. The kind of ambient, unpolished guitar rock heard here was a major staple of The Dead’s performances from the Acid Test period of 1965-1967 to the more polished, harmonious, bluegrass influenced incarnation of 1970, when the band released Workingman’s Dead, their fourth album. The 16mm copy of Nelson’s The Grateful Dead held in Melbourne and screening at the Cinémathèque is one of the only existing copies available, and as such, you are able to experience what the Deadhead longs for – insight into the ambiance of the ambient: early and rare footage of The Dead performing during the Acid Tests. “Let there be songs to fill the air”. Enjoy. “The Golden Road (to Unlimited Devotion)” on their debut album received the McGannahan Skjellyfetti accreditation. “McGannahan Skjellyfetti” was the authorial pseudonym used by the band for group compositions (“The Golden Road” and “Cold Rain and Snow”). The name comes from Kenneth Patchen’s novel Memoirs of a Sky Pornographer, in which Skujellifeddy McGranehan was the protagonist’s literary agent: “May I call you Skujellifeddy? Mr. McGranehan’s sort of awkward”. Ashley Allinson is a teacher and writer from Toronto, Ontario. He currently lives in Toronto where he writes independently.